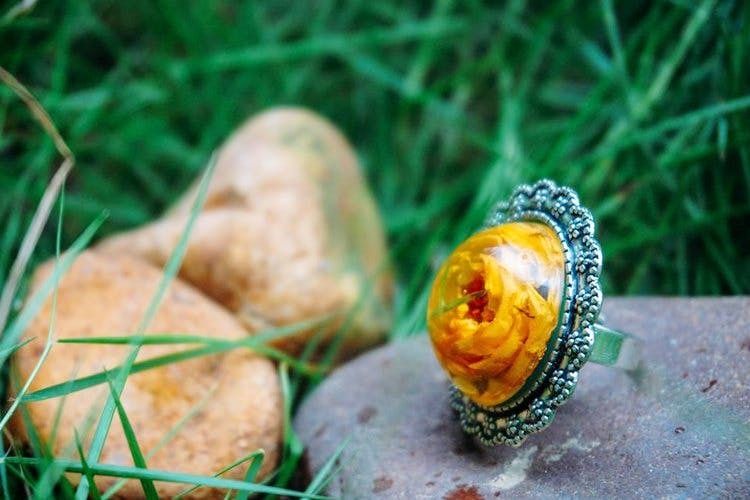 Chennai-based Alankaara offers whimsical jewellery pieces with real flowers that have been preserved in different mediums to create a natural effect. They also make gorgeous memory boxes. Think of a majestic rose or stately chrysanthemum or the rare orchid. Now imagine them carefully preserved with their colour and delicateness intact in glass, and then strung into a neckpiece in the form of a pendant, or even blooms arranged into transparent bangles. Well that’s the beauty and uniqueness of designer Amrita Giriraj’s beautiful baubles. The designer works with a range of blooms such as roses, dandelions, bouganvilla, orchids, jasmines and more, to create stunning jewellery. Take your pick from earrings, pendants, chokers, rings, bangles, bracelets and anklets. Amrita also makes wooden memory boxes with an enamel inlay on top, with preserved flowers pressed inside glass. She has been known to press seashells too in her creations. During the Chennai floods last year, Amrita’s prized garden got submerged under water and took with it many beautiful flowers and greenery. The enterprising designer then decided to retrieve some of the flowers and preserve them forever in the form of jewellery. And that was how her lovely flower collection was born. The jewellery is made by underprivileged artisans and Amrita considers her business to be a bit of a social enterprise.